My 15-month-old loves books with sounds in them. She loves hearing different animal sounds and pointing at the animals so that daddy will make the sounds. Noisy books aren’t best for bedtime though, unless they’re all about going to sleep, like Fleur McDonald’s new book, Noisy Nights. Noisy Nights follows Farmer Hayden as he tries to get to sleep. It is very noisy on his farm, between the crickets, dogs, cows, sheep, horses, foxes and trains. Farmer Hayden just wants to sleep but the animals just won’t be quiet. When he goes outside to look at his farm and his animals it is the sheep who help him to get to sleep. Noisy Nights is a delightful picture book that young readers, especially preschoolers, will love. It’s the perfect picture book to curl up with and share together at bedtime as it leaves you feeling relaxed and sleepy. 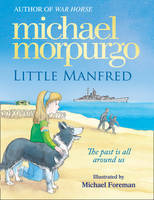 It reminds me of one of my favourite books from childhood, Jill Murphy’s Peace at Last. The noises of the farm are keeping Farmer Hayden awake, much like the noises of the night that keep Mr Bear awake in Peace at Last. I certainly have fun making lots of animal noises while I read Noisy Nights. It would be a great book to act out, with different children making all the noises. Annie White’s illustrations are the perfect match for the story as the tones of the colours are soft and the animals look cuddly. I really like the way that Annie has portrayed Farmer Hayden and his frustrations. You can see him getting increasingly tired and agitated throughout the book. Grab a copy of Noisy Nights and cuddle up with this delightful story. Win a copy of Noisy Nights! Thanks to everyone who entered. The winner is Vicki. Some books grab hold of your heart from the first page and don’t let go, even when you’ve reached the last page. When I first heard about Pax by Sara Pennypacker I knew that it was going to be one of those books and from the moment I picked it up I knew I was going to love it. Pax is a beautiful heart-breaking story about the connection between a boy and his pet fox. Sara Pennypacker makes you feel this connection between Peter and Pax and you read the story with hope that they’ll find each other but dread that they might not. Pax is also a story about never giving up, even when the odds are stacked against you. Both Pax and Peter face many challenges but they are determined to find each other. Sarah Pennypacker grabs you from the first chapter, giving you an immediate connection with Peter and Pax. It’s a very emotional start to a story (that will probably make you cry) and you have to know what will happen to Peter and Pax. Jon Klassen’s illustrations are stunning too. His illustration style perfectly captures the tone of the story. The story starts with Peter leaving Pax in the woods at the side of the road and driving away. Peter’s father is going off to war so Peter has to go and stay with his grandfather. This means he is not allowed to take Pax with him and his father tells him he has to set him free. As you can imagine, this would be hard for any child to do, and you feel how hard it is for Peter to do this. Peter found Pax clinging to life as a kit. Peter’s mum had just died and so he found Pax when he really needed a friend. They had been inseparable ever since, until this day that Peter is forced to leave Pax. The story alternates between Peter and Pax’s point of view and we follow both of their journeys to find each other again. There are times that you wonder whether they will both actually survive long enough to do so. I loved the characters of Peter and Pax, especially their determination. They will stay in my head for a long time and I already want to go back and read their story again. My favourite character though was Vola, a woman that Peter meets and who helps him. She’s a really interesting character because she has been damaged by war and is used to living alone. I love the way that her character develops just through her relationship with Peter. Pax is an amazing story that I can’t praise enough. It is perfect for those who like stories with animals, for fans of Michael Morpurgo and highly recommended for those who have read The One and Only Ivan by Katherine Applegate. You know sometimes when you see a book and instantly fall in love? I had one of those moments recently when I laid my eyes on Creaturepedia by Adrienne Barman. I first saw this book on one of my favourite book websites, Love Reading 4 Kids and the cover really caught my eye. When I finally got my hands on a copy of the book from my library I fell in love. Excuse me while I gush over this book. Creaturepedia is a visually stunning book about creatures from all over the world. The book’s by-line is ‘Welcome to the Greatest Show on Earth,’ and it’s not wrong. Adrienne Barman introduces us to creatures great and small, huge and miniscule. Adrienne has split the book up into different sections, with names like ‘The Champion Breath-Holders,’ ‘The Masters of Camoflage,’ and The Show-Offs.’ The beauty of this book though is that it is perfect for dipping in and out of. You could pick any page at random and it would make you go ‘Wow!’ Curious children could flick to ‘The Lilliputians’ and discover that the Bee Hummingbird is the world’s smallest bird at 5.7cm long or that the Dwarf Gecko is the world’s smallest reptile at 1.6cm long. Artwork credit: This is an excerpt from Creaturepedia by Adrienne Barman, published by Wide Eyed Editions. Before you even open the book you can tell you’re holding a work of art in your hands. The publisher of Creaturepedia, Wide Eyed Editions, clearly knows what makes a great book. The love that went into producing this book is evident, from the hardcover to the binding and the vibrant colours to the high-quality paper. Get your hands on a copy of Creaturepedia by Adrienne Barman and fall in love with this stunning book! Creaturepedia is just one of the gorgeous books published by Wide Eyed Editions (distributed in Aus/NZ by Allen and Unwin). Check out their website now. Like the main characters in his other books, Zac and Jess are just normal Kiwi kids, who happen to be in the wrong place at the wrong time (or maybe the right place at the right time). Zac gets dragged by his dad to come and live on the remote Terawhiti Station, and it’s while he’s here that he discovers the wreck of the yacht and the paw prints in the sand. When they discover the Phantom of Terawhiti, Zac and Jess know that they must do everything they can to protect it. Kiwi kids will relate to Zac and Jess and will imagine themselves in their shoes. In the jungle, the mighty jungle, the little frog finds an egg. But the snake wants his egg, and so does the eagle, and so does the lizard…But what does the angry elephant want? That’s Mine! by Michel Van Zeveren is a gem of a picture book that’s simple, yet surprising. You start off thinking you know where the story is going, but it veers off in a completely different direction (these are the best sorts of stories). The illustrations are bold and I love the expressions on the animals faces, especially right at the end. The thing I like most about this book though is the text and the design. As each of the animals appears the sound they make turns into a word, like the eagle who flies in saying “Ack…ack…ack..actually it’s mine.” Children can follow the direction that each animal appears from by following the direction of the words (the hsss of the snake drops down from the top to the bottom of the page). I love the way that the text changes size depending on how loud the animal is talking and in relation to their size. On a page featuring all the animals, the text is largest for the elephant and smallest for the frog, so it’s clear that each of the animals has a different voice. That’s Mine! is the perfect picture book for reading aloud. You can do different voices for all the animals and make it really silly. It could even be acted out in the classroom, with each child being a different animal. Tagged as animals, Gecko Press, Michel Van Zeveren, picture book, read aloud, That's Mine! Everybody loves a cute animal photo, especially when it involves baby animals. The latest picture book by Corinne Fenton is filled with extremely cute photos of baby animals and it’s perfect for sharing snuggled up with your baby. Corinne’s lovely text is from the point of view of a parent, telling their baby just how special, precious and unique they are. I love the positive message of the text and parents will love reading it to their baby. I also really like the layout of the text on the page and the way Corinne has used different colours for the text. The text is perfectly matched with some beautiful photos of baby animals, from pigs and rabbits, to monkeys and elephants. When the text talks about eyes and ears, the photos are of baby animals with unique eyes and ears. The photos are quite extraordinary and will make you laugh (especially the monkeys holding their breath) and make you go ‘awwww’ (especially the baby elephant running along). I love that there is lots of white space so the focus of you and your baby goes straight to the animals, and that the photos are quite large and close up so that you can see the unique features of the animals. If you’re looking for that perfect book to give to a newborn baby or for a special book to give to your own baby this Christmas you can’t go past Hey Baby! by Corinne Fenton. Children love singing and dancing to songs like ‘The Wheels on the Bus,’ ‘Old MacDonald Had a Farm,’ and ‘If You’re Happy and You Know It.’ In the last few years there have been a number of books, based on these action songs, that have been given a Kiwi twist. Donovan Bixley’s The Wheels on the Bus and Old MacDonald’s Farm, and Do Your Ears Hang Low by The Topp Twins and Jenny Cooper, are recent favourites of mine. Scholastic New Zealand, along with Kiwi entertainer Pio Terei and illustrator Stevie Mahardhika, have just released a Kiwi version of ‘If You’re Happy and You Know It,’ called If You’re a Kiwi and You Know It! They have taken the original action song and given it a Kiwi twist by adding in some of our wonderful wildlife. Kids can join in the song and dig for worms like a kiwi, dive and play like a dolphin, strut around like a pukeko, slither away like an eel, and many more. The actions are easy to do and you can have a lot of fun pretending to be different creatures. Stevie Mahardhika’s illustrations are beautiful and they get funnier as you go through the book. I love how each of the animals pretends to be a different animal (the kiwi and pukeko trying to dive like a dolphin and flap their flippers like a seal are absolutely hilarious!). The book comes with a great CD of Pio Terei singing the song (and just the guitar accompaniment), as well as a Te Reo Maori version of the song. Thank you so much Scholastic New Zealand for including the Te Reo version of the song on the CD and for including the Te Reo lyrics in the back of the book (rather than as a separate book). This is a godsend for librarians like myself who will use this book and CD in their preschool sessions in the library, and for parents all over the country. We certainly need more bilingual books of this quality. 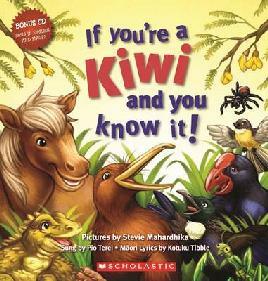 Get a copy of If You’re a Kiwi and You Know It! from your library or bookshop now, and sing and dance along with our wonderful wildlife.